The glitter, glory, royalty and richness that have been long associated with gold reflect in the Golden Triangle of India Tour. A saga of royal statement and power, Royal Golden Triangle Tour revolves around the three royal hubs of India – Delhi, Agra and Jaipur. Delhi, the capital of India has been shrouded in history as a continuous center of power. Dotted with the traces of many kingdoms and empires, Delhi reveals its royal self through the architectural legacies in Golden Triangle Tour. Agra is of course the City of Taj presenting itself as a heritage city of Mughals in India. The capital of royalty, Jaipur is best known for its royal splendour and famed for forts and palaces of the state. The architectural achievements of Royal Golden Triangle Tour make this journey a wholesome and rich experience of life. Arrive Delhi at Indira Gandhi International Airport then transfer to hotel for Overnight Stay. 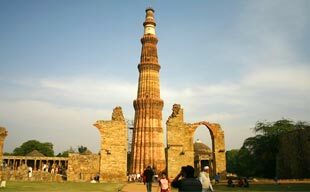 After breakfast proceed for sightseeing of New Delhi:-designed and built by the British in the 1920's it's a city of wide boulevards impressive Government buildings, green parks and gardens & Qutub Minar. Then your drive takes you along the ceremonial avenue, Rajpath, past the imposing India Gate and Parliament House. Old Delhi: - An ancient walled city. Red Fort, the most opulent Fort and Palace of the Mughal Empire; Raj Ghat, the memorial site of the Mahatma Gandhi; Jama Masjid, the largest mosque in India and Chandni Chowk, the bustling and colorful market of the old city. After lunch drive to Agra, on arrival check-in at hotel & overnight stay at the hotel. Breakfast at the hotel. Proceed to visit Taj Mahal. Taj Mahal one of the seven wonders of the world. After that visit to the Agra Fort. After Lunch drive to Bharatpur enroute visit the abandoned Mughal city of Fatehpur Sikri - built in red sandstone in honour of Saint Salim Chisti who foretold the birth of 3 sons to Emperor Akbar. On arrival check into Hotel & overnight stay at the hotel. 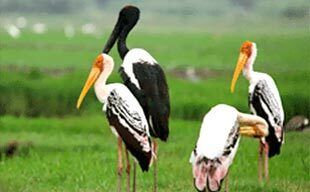 Morning visit the The Keoladeo Ghana National Park- one of the finest bird sanctuaries in the world. The marshes here are home to over 360 species of birds including the Siberian cranes that come to spend the winter here. Proceed for Jaipur. On arrival check in at hotel. Sightseeing of Jaipur. Start with City Palace in the heart of Jaipur which is known for its blend of Rajasthani and Mughal architecture. Jantar Mantar is the largest of the five observatories built by Sawai Jai Singh. The Hawa Mahal or the Palace of Winds was constructed for the royal ladies to watch the royal processions without being seen, Late evening is kept free to visit the famous markets of textiles, gems, carpets, and handicrafts. Jaipur is an ideal place for buying souvenirs. Overnight stay at the hotel. After breakfast explore the city with an excursion to Amber Fort, on the top of the hill on which the fort is situated. Amber Fort is the classic romantic Rajasthani fort palace. Later drive to Delhi. Evening free at Janpath & then after dinner & transfer to airport to catch flight for onwards destination.